Because the Sims 2 baby was just the best! Update 11th June 2016: Fixed the facial bone assignment that caused the face to become very wrinkled with some expressions. Also improved some details in the mapping of hands, knees and ears. 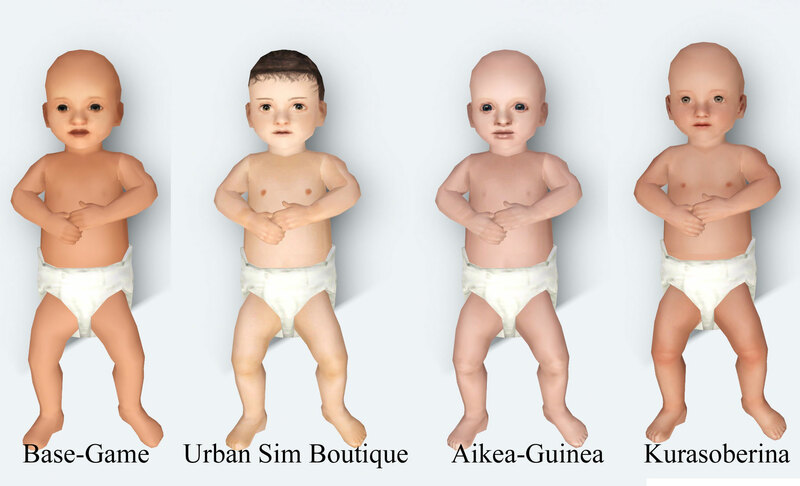 These changes only affect this mesh with the diaper, downloadable here on MTS. Any other outfits will still use the previous version, unless the creator updates them as well. For creators: The facial fix was done by assigning all polygons that were previously "left/right lower lid" to "left/right cheek". This can also be done manually in Milkshape. This is a conversion of the ts2 baby mesh. It's noticeably larger than Quizicalgin 's mesh, and it uses the sims 2 head and face. I thought it might be a nice addition for slightly older babies. Technically, the whole thing, including body and diaper, is an outfit. It's enabled for both genders and Everyday (the only category that works with babies), and is not Valid for Random. Therefore you need NRaas MasterController to change your babies into the new mesh. 1. Download and install NRaas MasterController according to instructions. You only need the base mod. 2. Ingame in live-mode click on your baby with any active sim. Click NRaas. 3. In the window that opens, click "Stylist". This opens the Ambitions Stylist Room with your baby in it. Now you can go to Clothing/Everyday/Outfits, and there you'll find the ts2 mesh to select. Follow the instructions above until step 2. Instead of "Stylist", click Advanced / Edit in CAS. There change Skintone just as you usually would. The diaper has one cast-able channel and the one preset shown. This mesh is compatible with all existing baby hair and certain accessories. This includes most things that go on head, neck and arms, Quianna's accessory tights, but no shoes. That being said, I haven't tested every single piece of baby cc out there. When in doubt about something, try it. Bone assignment is as smooth as I could manage, though sometimes the mesh didn't play along nicely. A noticeable thing is that the mouth can't really open, so textures get stretched when the baby is laughing in the swing or stroller. Looks okayish though (and also strongly depends on the skin). If you want to use this mesh in a project of your own, you can do so without asking special permission. Just don't do anything illegal and don't ask money for it. This would actually not have been possible in this form, without the pioneer work of Quizicalgin and Aikea Guinea, who first made a baby with feet and a skin for it. Credit for the meshes and the ts3 basegame textures goes to EA of course. Thanks to the Programmers of SimPE, S3PE, TSRW, Milkshape, Photoshop and Gimp, all of which were used to make this item.